See also new companion post which analyzes orders to discover they consistently use Satanic ‘magic’ numbers in the order quantities, in which decoding indicates their purpose. Updated Aug 30 2012 This post continues to be subject of disinformation tactics at third-party sites, and a link to this page at the official National Republican Convention Web site for use by Delegates and Media was taken down (censored). A prior update reflected two commentaries. In twenty-four hours, the number of disinfo commentaries has doubled. I have to ask why they fear this article being read. Prior updates below marked in red. Why does DHS want to go to war with US citizens? Copyright © 2012, all rights reserved. Permissions to reproduce by request only. This restriction will be lifted once it is clear there are no corrections or major updates required. The topic is too important to have multiple versions all over the Web, but there needs to be multiple copies that all may be informed and forewarned. If you see an error please report it IMMEDIATELY, thank you. Update Aug 26: Day One, and already breaking news requires an update! Update: Aug. 29: Some critical commentary on this article outside of this site dictates some additional clarification regarding hollow point ammo. Nothing on that topic changes the importance, relevance, or thrust of this post, and is a small technical matter of importance to people who live and breath in the World of firearms. If this post has inferred that I claim to be an expert at such a level, that was not its intent. The question on my credentials as such an expert has no bearing on the larger question as to why so many rounds should be ordered, and related issues. To choose to focus on that as a reason to ignore or discount this post is to avoid discussing the issue by switching topic, and by attacking the messenger, both being known disinformation tactics found in the 25 Rules of Disinformation. The update is reflected in the appropriate section with red highlight. Is DHS engaging in disinformation and concealment of information? revolution • That DHS has ordered more bullets than the Pentagon uses in a war… many times over. If you are a Web Walleroo, you can stop reading right now and find something shorter and less scary and more fun to read, here. Really, you will like it rather lot; its pretty funny, and I’m not kidding (well, I was when I wrote it). But what follows is for concerned citizens who believe in the Constitution and fear it is in danger of extinction… or things worse than even that. Come back here when ready to be serious. I assure you it is very interesting and highly informative, even if you’ve already been exposed to the general topics involved. Let’s start with the ammunition. If you didn’t know it, DHS (and if you don’t know that acronym then stop reading right now and go back to sleep because you will be impossible to wake up, anyway) has placed orders for 450 million rounds of .40 cal. hollow-point ammunition, more than enough to kill every man, woman, and child in the U.S. and Canada. The story, like all matters which reveal the scary side of a government out of control, is ignored in mainstream media, and not well understood in Web accounts. You will mostly find alarmists (like myself, I suppose) making dire predictions and quoting some other alarmist site as THEIR source. That’s no better than circular references or a reference from a chat room message. Some guy said some guy said, and so on. I at least try to do better than that; to give you actual documents where possible, and find better ways to put it into context, or quote sources I’d hope you find acceptable. But hurry: the primary document resource cited for most of these (FedBizOps.gov) will sometimes let you access the needed details, but it seems that someone is selectively turning off the feature for the more controversial documents and requiring ‘membership’ to get the good stuff. 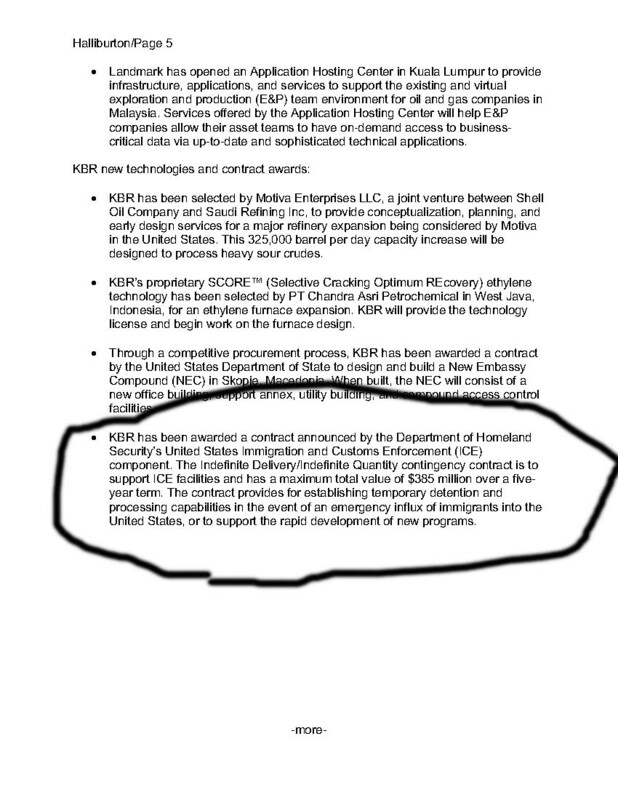 Go back to 2009 and we find DHS through its ICE Division (What? You don’t know what that is, either? Zzzz) ordered 200,000,000 rounds of munitions (not reflected in the table). That’s enough to invade Mexico and shoot everyone within 100 miles or more of the border several times (the ones not shot already by the Mexican drug cartels using ICE supplied weapons). That certainly ought to end the illegal immigration problem (perhaps that was ICE’s intention in Operation Fast and Furious? ), but it’s thankfully not been used for that, has it? This story was originally made public on line through a Press Release from the Winchester Firearms company who received the contract, though both Winchester and Market Watch (Dow Jones site) where the notice had first appeared have both pulled the notice in light of the recent fervor (furiousness?) caused by such as Alex Jones who was perhaps first and hardest hitting on the story as it unfolded. It wasn’t that much of a story until DHS requested bids for an additional contract for 450M more rounds. It was actually the announcement of an extension to the order which caught the attention of we ‘alarmists’, but in trying to track it down, all you get is… yet another Press Release which has been pulled by the contractor and Market Watch. But pulling public files did not take place with either the 450M or 200M order until word spread on the Web and questions as to why kept popping up. And WHY indeed? It is so many rounds that it had to be scheduled for delivery over several years, but because the order has been ‘censored,’ I can’t tell you how many years, and not found other sources yet who have so indicated. Therefore, in the table above, they are included over the same number of years as each of other large orders have been for, which is always four years — perhaps because that is the number of years served by a President, who directs the Agency, and the orders coincide with an elections for some reason. So that’s what I used in the table, and as the .223 is the most common rifle round, and the .40 is the most common pistol round, I apportioned the 450M (.40) order the same as if the .223 ammo as found in yet another mammoth order (750M rounds) to be discussed shortly. Thus while the totals for rounds over all four years should be correct, the totals in any one year may be off. No matter how you divide it up, however, its still a hell of lot of bullets. This one is an earlier item (April 2012) only recently revisited and discussed because of the uproar over the 450M order. All of it is .223 rifle ammunition to be delivered over four years in equal installments of 2M rounds of target practice ammo, and 33M rounds of standard duty ammo, each year. We will take a closer look at the significance of .223 ammo, shortly. The order is included in the table, above. But because this order was relatively small, and a bit older, it has garnered less coverage on the Web and may be news to many readers. DHS was apparently hoping that to be the case, because even though it had already been cited on the Web (how I found it), the official documents have once more been censored, and here they are. This kind of ad-hoc censorship violates law according to restrictionist.wordpress.com, where I found it. DHS next used the TSA (keep sleeping) as the vehicle for its next buying binge. They are seeking bids to supply 20,000,000 rounds per year of .357 (remember Dirty Harry? We were all pretty awake, then). It is stated as being for ‘target practice.’ This ammo is included in the table. Well, that’s a nice thing, isn’t it? We shouldn’t worry because it’s only target practice after all. Except for two things: 1) TSA agents do not have guns, and DHS has not put out a bid request for weapons to match; 2) there are only 58,000 TSA agents nation-wide, with only a small fraction of those actually front-line ‘Officers’. So that would mean each employee would be firing off a minimum of 344 rounds each, if every one of them were so required. If you’ve ever done much target practice, you know that’s rather a lot of practice when you don’t have a gun in the first place, and most agencies only require one annual shooting exercise. So this appears to me to be a cover up disinformation ‘purchase of target ammunition’ to imply by association that the other (larger) orders are also for target practice, a notion some ‘pro DHS’ commentaries have already stated in conjecture. And DHS is still not through, getting the Weather Service (NOAA) and Social Security Administration into the act with orders (included in the table) for 46,000 and 174,000 rounds of .40, respectively, as again reported less widely on the Web. In fact, by the time I post this or you read it, it will probably be out of date with yet more orders being placed for any Agency you ever heard of, to include Highway Dept. Workers, Firemen, and Postal workers. (I cite those three because in prior years, officials and commentators here in Oregon have specifically mentioned the possibility). 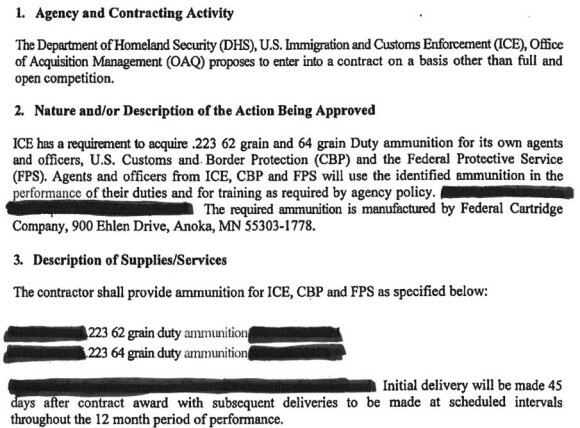 We next find from an official .pdf file that DHS is seeking to buy even more ammo. Someone got wise to the government swallowing up evidence, and went to the trouble to obtain the actual document quickly. I’m not sure, but I think we owe Alex Jones or one of his followers for that. This time, the order is so large that it is 91 pages long, and totals more than 750M rounds over four years. Most people reading the .pdf make the mistake of assuming it five years, because it is in five parts. However, Parts I and II are for the first year, and thus the above table combines them under 2012. The cover story is indeed ‘target practice,’ and when you look at any one line item on the first page or so of the .pdf, a glance makes it seem fairly plausible, especially if not prone to suspicion, like me. But as you investigate the specifications more carefully, you see that is only possible for select line items which turn out to be the proper choices for target practice and which appear in appropriately small numbers (e.g., 2,000 rounds vs. tens or hundreds of thousands for the same ammo in non target practice versions). Regardless: there are about 200,000 DHS employees, most of whom are office workers. But even were each one armed, that would be 7 thousand rounds per employee for target practice. Bang, bang, away, Baby, bang bang. The totals and specifics of all these orders is very disturbing for many reasons. The reason most noted by others is the specification of hollow point rounds. There are a lot of misconceptions about what that means, however, so I’d like to make clear the truth. Hollow point, when jacketed with an outer hard metal coat, has only one purpose: to penetrate armor vests. When not wearing a vest, jacketed or not, it will insure a kill by ripping out literal lbs. of flesh instead of making a clean hole. A bullet hole going in, a fist-sized hole coming out if not stopped internally; no surgery can save you if hit amid the body cavity with a hollow point, presuming a clean hit at sufficiently close range, and that is why it has been illegal internationally for use by military since 1868. Update to above paragraph: ONE person implying expertise has faulted this post based on the above paragraph, without providing particulars. I only respond to the criticism because the point of review in question does enjoy some traffic and results in referrals to this URL. The only reason the above paragraph is in the article is because many other articles on topic have claimed that ALL hollow point rounds are for penetrating body armor, and THAT IS NOT TRUE. That, and the fact that many such posts also state hollow points ammo is illegal and that is only true by exception in a few locations. The remaining statements are intended to be general in nature and reflect comments of gun store staff and general review of Web content. If someone would care to point out any specific inaccuracy with some basis, I’d be happy to make a correction. I urge readers to judge any criticism in tone and detail and decide if their purpose is to dissuade the reader from reading, or to show a specific fault in some key and important way which truly invalidates the greater message. I stand by my work. But hollow point is standard issue to Police and even required for hunting under various laws, and generally legal in most States for civilian purchase because it helps cut down on fragmentation. It thus not only better insures a hunted animal will not escape with a painful long-term wound, but die a more humane quick death (I’m compelled here to say I’d rather hunt with Crossbow if hunting at all, but I don’t see killing such noble creatures for pleasure as sport), but it also prevents nearby persons from suffering wounds in ricochet fashion in urban shooting incidents. The part which is troubling is this: only people who traditionally have body armor are the military and Police. Almost all the rifle and pistol rounds specified are hollow point, and most of those are jacketed. So the question many are asking on the Web is still valid: is DHS preparing for combat with members of these forces who perhaps understand and actually intend to abide by their Oaths of Office and uphold the Constitution? Perhaps if you are a member of an LEA (Law Enforcement Agency), you should be figuring out if that means you — and what you are going to do if that is indeed the unfortunate case. And think about this:. There are enough jacketed rounds to allow more than ten shots for every law enforcement officer in America. Remember how they wiped out the Jedi? A troubling thought, it is, my young Padawan. I do believe that I am the first to point out this particular slant: the larger order includes ammo for a weapons or at least descriptors which make little sense, as they are not common to any US Agency. There are lots of German Luger rounds, for instance, and bullets more common to European use such as the Russia’s Cold War era favorite, 7.62x39mm (the .pdf itself says ‘Soviet’). That is reminiscent of a strange bid proposal for 7000 5.56x45mm NATO assault rifles (that look like machine pistols) ‘for personal defense’. That order was even more unusual in the absence of any order for ammunition, then or now. In considering NATO, we need also to consider the .223, which is used by the U.S. Military in AR-15 rifles like that used by James Holmes, and which is also a NATO standard. An aside: The Luger rounds are curious because the Luger company of WWII fame is no longer in business, and antiques guns are all which remain. They employed various special munitions of unusual shape, though all were 9mm in ‘size.’ Today, there are many modern guns made around the World which employ 9mm of the same size but of differing, incompatible (with Luger) design. It is common that users of today’s weapons specify their ammo simply as ‘9 mm’ along with any variant specifications such as also included in the DHS order. There is, however (IMO), a tendency in older fascist war dogs to employ the German term ‘Luger’ when talking about 9mm ammo for non Luger guns of today — a kind of sad, nostalgic romance of sorts. Some ammo makers tend to play to this by making the word Luger larger on the ammo box than the company name, but most respected makers don’t label it as such, at all. So the inclusion of the unnecessary and non defining word in a technical description of an official government purchase document carries with it a subtly implied psychological marker as to their political beliefs and agenda. For at least four decades, select militia, FEMA Camp and NWO related conspiracy theorists have long predicted that when the S**t hit the fan, it would be NATO forces, or ex Soviets disguised as such, who enforced Martial law against U.S. Citizens. As I reveal in my book set, Fatal Rebirth, CIA is known to have ‘imported’ tens of thousands of ex KGB and other soviets, most of whom are thought to now work for CIA fronts. I’ve spoken with more than one such person working for one such front. So if foreigners were to be so employed, real or otherwise, some among their total may already have weapons, and some may be in need of being supplied with weapons, but have access to munitions from the hands of those who brought their own guns… or they will need to get their ‘NATO’ ammo from DHS. The basis of this theory is that we would be less likely to shoot at (real or pretend) NATO troops, and is based in part on comments to that effect by NWO kingpins such as Henry Kissenger, who said at a Bilderberger (Zzzz) meeting, “Today Americans would be outraged if U.N. troops entered Los Angeles to restore order; tomorrow they will be grateful! … When presented with this scenario, individual rights will be willingly relinquished for the guarantee of their well being granted to them by their world government.” There has been a bit of proof of the theory, as well, in the form of endless trains and convoys or storage areas full of NATO vehicles, often WWII Army surplus or surplus Soviet gear, right here in America. This has been described in another of my posts, including the fact that NATO has denied any vehicles are located here, and that they employ no U.S. or Soviet vehicles anywhere in the World, save those we might bring with us when participating in partnership efforts. I’m pretty certain I’m the first to point this out, as well: roughly 9,000,000 rounds of rifle ammo in the large bid request are sniper ammunition. Sniper rounds feature larger, heavier slugs and employ a special hollow point design for better trajectory, as detailed in the technical specifications in select line items for .223, 30-06, and .308 rifle rounds (red tinted in table). Why would any of the agencies thus far mentioned have any need for sniper ammunition? Who do they intend to snipe, and why, and under what circumstance, and under whose authority? What Congressman is willing to demand an answer to these questions, and the many other issues these troubling orders raise in the minds of the public? I don’t even hear Ron Paul daring to ask. Why not? Why don’t you ask YOUR Congressman, this very minute. (link offers voice/mail/email contact for all elected officials via usa.gov). I again urge you to ask, because 9,000,000 is more than ten rounds per Policeman, and likewise enough to take out every politically incorrect activist in the country that’s ever been identified by an Agency as such. Agenda and expediency defines who is in the crosshairs. I finish the ammo section with a look at this ammo because they’ve not only ordered roughly 2M rounds per year (like I said, reasonable for target practice), but a whopping 694,000,000 rounds (694M) in year three (page 15 of the .pdf) of the largest order. That’s more than enough ammo to kill the entire population of North America and have nearly 300M rounds left over. Put another way, its about 210 shots for every assault rifle in civilian hands, which can also be expressed as about 26 shots per member of an assault team sent after that rifle. Now you know what your gun is worth., and what it will take to defend it; dodge 210 rounds, and you might just make it. Really, you can: the GAO says the military is firing off as many as 250,000 rounds per insurgent killed in Iraq/Afghanistan, and in WWII the number was 10,000 for every German killed. But for the French Resistance, the number was in the hundreds of rounds. Citizens tend to have the edge if it comes down to it, doing more with less. Che Guevara says as much in his booklet, Guerrilla Warfare, available online. Between that and the ideas in my book, Fatal Rebirth, you actually stand a decent chance (you can get my book free – info at article end). My other book series, The Professional Paranoid, can even help deal with intelligence agencies and general security and privacy issues. Helping folks who are targeted is what I do, and its based on successes in my personal battles with rogue operatives from multiple agencies and law enforcement. That included several attempts on my life, but also included helps from righteous members of some of the same Agencies involved. Not just surveillance drones, but armed drones. They are talking Predators. A Predator can be armed with all manner of cameras to include IR and ground penetrating radar capable of seeing in the dark and seeing through walls, ceilings, and dirt (small systems such as might be used on a Predator could probably see at least 20 feet deep or more). But they can also carry almost any single shot or rapid fire rifle or machine gun, including sniper weapons capable of delivering explosive rounds resembling small cannon fire in terms of damage. Some of these larger weapons feature laser targeting guidance allowing expended-round trajectory adjustments all the way to target. Then, of course, there are a larger laser guided munitions, the most popular of which are air to surface missiles the military has already used to kill U.S. Citizens abroad. Now they want to do it here in the U.S., it seems. Probably for a good reason though, so we can all sleep well, right? Why four were here in Portland just the other day. One flew right over my home at about 200 feet. I slept REAL well. The Predators are going to be made available (and already have) to law enforcement as well. But wait. It’s not the Police who will operate the Drones, it is the military, which makes it a violation of the Posse Comitatus Act of 1878. Darn. I forgot. Congress decided they wanted a Military Police State, after all. So now, the military cannot only surveil you, but they can detain you (without arrest) indefinitely (vanish you), or even assassinate you, no warrant, no questions, done deal. That’s the Obama way per the National Defense Authorization Act, which effectively removes the Constitution, Bill of Rights, all prior case law, the Supreme Court, and even the Magna Carta from having legal usefulness. YOU HAVE ZERO RIGHTS! The President has the same power under NDAA as did any King of the Dark Ages. Drone use is even more reassuring given the rise of police violence of late. At least four instances of outright murder in broad daylight in recent months, even on camera, and they still seem to get away with it as ‘justified’ once they finish with their ‘investigation.’ But Anaheim tells us that the people are starting to refuse the legitimacy of such investigations, and THAT is perhaps why Police might at some point wish they could unleash a missile on an unsuspecting crowd. Its only a matter of time, convenience, and one stupid fascist psychopath in charge. 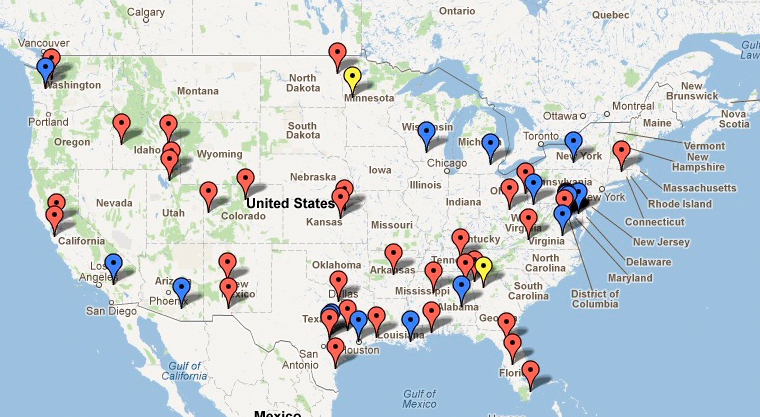 Thanks to the Electronic Frontier Foundation (a kind of Civil Rights group for the digital world), we now know that there are already 63 authorized drone flight control locations (see map below, visit link to see individual locations) in the US. This includes the military, ICE, FBI, NASA, 25 universities, and towns as small as 2,500 population. There are three thousand licensed ‘pilots’ of drones, which according to statistics, means about 750 psychopathic personalities have buttons of destruction under their fingertips. The thing to take away is this: while not all these drone sites employ Predators, and not all drones have the capabilities of Predators. That there are 2,500 operators means that there are nearly that many drones in use any day of the week, say 2,500, of mixed types and capabilities. Many drones are quite portable and can be launched from anywhere you can get to in a car, and can be operated from a laptop. What is also true is that certain operators do not need disclose either their control points or launch points, or pilot count. These include the Military, NOAA, DHS, and Dept. of Agriculture — and despite the unhappy picture all of this presents for Constitutionalists, the bright side is that DARPA was disapproved to operate them, as well as some cities and county law enforcement agencies. One thing is certain. This picture will change for the worse with great frequency. Do not feel too intimidated by all this doom and gloom. Do not fear being sniped or hit with a swarm of Men in Black. Do not fret over constant surveillance. You can simply volunteer yourself for arrest at the first opportunity. That comforting notion, in turn, leads us to the topic of the number of FEMA detention camps. Excuse me, ‘emergency housing centers.’ I’ve been shown one specification for such ‘housing’ center, and it clearly indicated 8 square feet per person, bars, barbed wire, high security doors, and lots of cameras, no windows, and nothing whatsoever like family accommodations: men away from women, and children not even mentioned. But that was years before I started to actually believe it possible. What about today? 215 FEMA camps — myth or reality? This is another decades-old ‘conspiracy theory,’ but one rapidly proving true, unfortunately. Actually, the number is unknown, and unverifiable — and whatever it really is, it likely changes almost monthly. Many people have attempted to ID a given suspect camp, but at best, all they can usually manage is to verify the location looks like a concentration camp in ready state. For example, barbed wire pointing in, high security turnstiles, windowless buildings in row-like arrays (think Stalag layout), internal security barriers, rail access, signs of military markings, high perimeter towers, radio towers — and no sign of life until you try get too close, when security forces race up to urge you to leave NOW. Type in FEMA camps in YouTube and you will be amazed at all the hits, some stupid, some disinformation to make you think it unreal, some well done and convincing. Nine such facilities were built around the country with a total length of time allotted for eventual destruction of weapons of ten years, coincidentally ending in 2012 (so now those workers have nothing to do when they come back from vacation). However, any one of the plants could have handled the entire nation’s supply of all biochemical weapons (not just those slated for destruction) in three year’s time. This means a deliberate over engineered capacity of some 8000%. More to the point, at speeds suitable for weapons with metals in their construct, it can process (incinerate) more than a ton in weight every hour. But if burning something easier to burn, it can run many times faster. In fact, in my book Fatal Rebirth, I show how it could be used to dispose of dissidents and other undesirable persons in a Martial law scenario at rates of hundreds per hour, 24 hrs. a day. It is, after all, essentially a conveyor belt into a super heated furnace. Thus based on just these two Oregon camp locations, I have to give some credence to the Dude’s map, and to those crazy conspiracy theories about Martial Law I’ve been writing and warning about since 1994, or even wilder theories about population reduction. Pandemic false flag, anyone? Let’s not be dumbed down Dudes. martial law military coup Warning signposts from local media which mainstream media deems not to share. DHS is not satisfied with little bangs and pops from firearms, they want more bang for the buck. Enough, in fact, to be real loud. This video shows what just 35 lb. of Ammonium Nitrate can do when confined in a hole in the ground. C-4 is even louder: this video is only 15 lbs. of C-4, taking out a bus, with minimal confinement. It’s OK, though, because this request for proposals is for training K-9 bomb sniffing dogs, they tell us. So let’s all go back to sleeping well at night, OK? Wait a minute… Doh! Gee, Marge… that sounds just a bit like a cover story. You can train a dog with the merest essence of drugs , and the same is true for explosives and bomb dogs. The best part is, you get to use the same stuff over and over for the most part. So you could train endless dogs with a couple of lbs. of drugs or explosives. Moreover, there are many other forms of explosives, and just as you train a dog for all types of drugs, you train explosives dogs for all kinds of explosives. Where is the rest of DHS explosives order for things like Dynamite, Nitro Glycerin, raw powders, all the various primary and secondary explosives, propellants, fuses, and so forth? Cover story. That’s just one reason some of us alarmists think there is another false flag terror event on the horizon, perhaps at the Republican National Convention. I guess that’s one way to insure Ron Paul does not make it to the Polls to have his chads hung out to dry, and to subsequently push through whatever sneaky legislation for loss of more rights they have in the wing waiting to be introduced ‘just in time,’ this time. Or, is it to foment the Martial Law for which they expect to use all that ammunition? All of the above? I want you well informed, because you NEED to figure out which side you intend to stand with soon; if it really goes that direction, you may have less than a few moments warning before any given LATE answer could get you killed. Only being prepared in advance assures a right answer and affords a shot at survival… for you and your country… unless of course, this is all mere conspiracy theory. I’ve over 1.4 billion reasons to think it a little more solid than that, and 300 plus million reasons to yet hope I’m wrong. You are one of them, as is each person in your family and mine. Those reasons are what we all live and die for, are they not. PLEASE: Comment (page bottom, or contact me), Rate (at page top), Share/Tweet this article. Visit my Reader Forum to promote your own cause or URL.